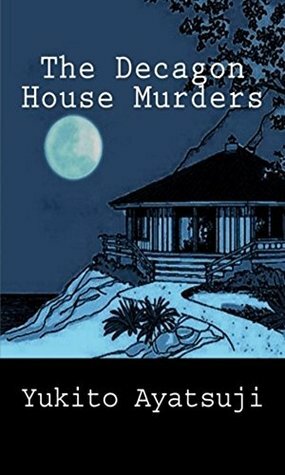 Goodreads review: The Decagon House Murders | Yeah nah. Imagine a ten-sided house. Add to it murder mystery enthusiasts, each bearing a famous crime writer’s nickhame. Add a sprinkling of weird fiction ghostliness and gothic murder. Then kill everybody. That’s The Decagon House Murders. At heart, the book pays tribute to Agatha Christie’s And Then There Were None: it aims to eliminate all its characters by the end, either by murder or by guilt. It’s very much in the classic, locked-room mould: the book was written initially as an offshoot of a university mystery club, where enthusiasts of that style of fiction would write tales in that mode, explaining their logic. It’s a format which, though popular through the works of Edogawa Rampo, fell out of style until the writing of this book, which relaunched an interest in the orthodox mystery, or honkaku. The story is simple: seven university students – members of a mystery society, each bearing the name of a famous mystery writer – journey to stay in a ten-sided house on an island. It’s close to a place where a murder-suicide event happened, and before long there’s proof that a killer’s on their trail. From then on, the story’s an investigation of both motive and method, and the demoralising effect of knowing that eventually, they’ll all die. It’s pretty gleefully enjoyable, to be frank. Though Ayatsuji’s prose is pretty flat, but I don’t see this as a negative. This was an aspect of the text which was pretty heavily criticised at publication, and some readers today still find it a bit confusing. I prefer to think of it as an attempt at transparency: the author is intent on making his characters chess pieces. They appear on the board and are moved about and captured with a precision that would be hampered or obfuscated by the addition of too much extraneous information. The book is brief, and enjoyable. It takes a little time to adjust to the unadorned prose, but once I was in I was reminded how much fun this manner of mystery story is: everything is there to allow you to solve the mystery, should you desire it. I found myself second-guessing the narrative a lot; it was a more active reading experience than I’ve had of late, that’s for sure. I was already aware of Edogawa Rampo’s stories but The Decagon House Murders, bought for cheap on a whim, has spurred interest in more Japanese detective fiction. It’s eighth on a Japanese list of best detective fiction, and the first in a series of nine weird-house-based mysteries the author has written, so I suspect I’ll have a lot more to get through in future. Let’s hope they’re all as clean and delicious as this one. This sounds like an awesome book. I loved the review. Would you mind if I republished it on my website? We’re building our review section.